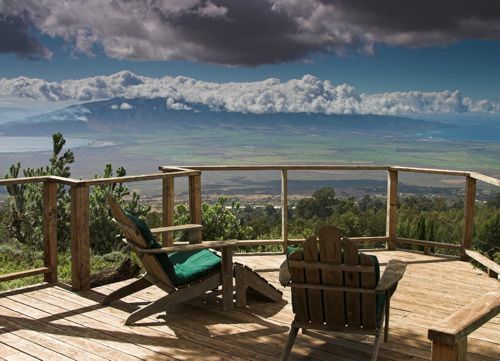 Upcountry dining brings together the views of paradise, cool breezes of Maui and the exceptional cuisine of local eateries. The chefs here	are excellent and have access to the freshest ingredients on Maui. Locally grown vegetables, herbs, and even the meats are surrounding the Upcountry region. What you will not find up here is large chain style or resort food. Romantic dining on mountainside terraces to small mom and pop diners are yours for the asking. Fine Upcountry Dining on a mountainside overlooking a tropical paradise. Suffering from a sun burn, let the cool mountain air chill your skin and blow away the stresses. Up country dining is laid back, real and extremely good. Find a quiet place grab a glass of wine and remember "You could be at home working". Offerings are from upscale to cafe. Get out of the resort zones and come dine in a cool paradise. Entertainment is happening in Up Country. A few restaurants up here sell alcohol but be especially aware of the roads and length of your drive back to you lodging. The Stopwatch Sports Bar in Makawao has the normal sports bar look with excellent foods. Casanovas Italian deli is the exception in upcountry. Here you will find surprising acts with big time names. Check there website for upcoming events here upcoming events here. Acts from the past include Los Lobos, Kool and the Gang, Willie Nelson, recently there have been a list of great local and Caribbean acts. Wednesday night is ladies night with drinks half priced. The tables below give you an idea of restaurants in the Upcountry area. This is not a complete list but a sampling of the many places to eat. Figure mixed drinks at $8.00 - $10.00 each. AREA PAGE Find the right area to stay in for your trip. HOME PAGE OK Get me out of here. Thank-you for visiting my site, to quickly tell me your thoughts please click here.